London, 1949: DI Ted Stratton sets off with a colleague to look for the bodies of a young mother and her baby daughter. Hours earlier in Wales, John Evans, the woman’s husband and the baby’s father, had walked into a police station in Wales and confessed to the killings. It looks like a straightforward case for Stratton but by the time Evans has been brought back to London he has changed his story, blaming Norman Backhouse, another man living in the same building. In spite of some unanswered questions that make Stratton feel uneasy, Evans is tried and found guilty of the murder of the child, and goes to the gallows continuing to protest his innocence. Several months later at the house where Evans lived the bodies of several women are found buried in the garden and hidden behind the walls. What’s more, Norman Backhouse has left suddenly, spinning a dozen different tales to cover his tracks. Stratton arrives at the scene to find the press already there baying for blood; could it be that the wrong man hanged? Laura Wilson’s “A Capital Crime” is based on the true cases of John Evans, hanged for the murder of his daughter and John Christie, a neighbour of Evans who was found guilty and hanged for the murder of four women. Wilson cleverly weaves the real events into a fictional background. Most of what’s already been written about the case – known commonly as the “Ten Rillington Place murders” – is an examination of the evidence, looking in particular at Evans as a victim and making the point that he was convicted on shaky evidence. Wilson, on the other hand, has the benefit of using a fictional narration to look at the case from the point of view of the police. Her decision to end the story on an ambiguous note is one that challenges most writers on the case: while Evans could not have committed the later murders, there was never any evidence strong enough to completely exonerate him of the murder of his wife and child. In basing her story around the Rillington Place case, Wilson has chosen a most compelling and thought-provoking subject; Britain was gripped by the case and fans of true life crime stories continue to be fascinated by it. However, with nothing new to add to the facts of the story, Wilson’s decision to fictionalise the story is a good one, especially given that Stratton is already an established character with a good back story. 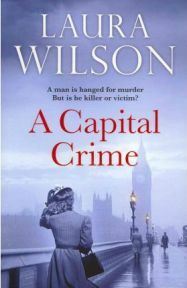 “A Capital Crime” is the third of Wilson’s books featuring Ted Stratton but the first I’ve read. He’s a good solid character, credible and easy to engage with. Wilson quickly brings us up to speed with Stratton’s situation and it’s obvious that this novel continues the series. Unfortunately one of two subplots depends heavily on the events of a previous novel and, while it’s not essential to read the books in order, I could see how readers who have chosen this because of an interest in the Rillington Place murders might be irritated by the frequent references to events earlier on. A loosely connected – both to the main plot and to the Stratton novels in general – subplot features Diana Calthrop; she appeared in a previous novel as a witness in a murder case, and she and Stratton are supposed to have hit it off. Diana turns up in Stratton’s life when she starts working at the film studios where his daughter, Monica, is a make up artist. This subplot is more than a little convoluted though it does eventually contribute to the dramatic tension towards the end of the novel when both she and Stratton’s daughter find themselves alone and vulnerable when a dangerous man is on the run. Where Wilson’s talents really shine are in her ability to set the scene so vividly. There are the obvious things such as using the 1951 Festival of Britain as a recurring motif but it’s the finer details such as what people were eating or wearing that brings the story to life. A thread involving Stratton’s daughter highlights attitudes of the day and proves enlightening and well researched. These meticulous details make for a highly entertaining read and as a piece of historical fiction this is pretty perfect. Overlooking the Diana Calthrop storyline, which serves no real purpose here other than to provide a convenient stepping stone to presumably re-introduce her relationship with Stratton at a later date, this is a well constructed and entertaining novel that has had me looking out the earlier Stratton novels. One Comment on "A Capital Crime"
I was a bit disappointed by Stratton’s War but thought that An Empty Death, #2 in this series, was one of the two best books I read in 2009 (I should say I read a lot less in 2009 than 2010 or this year so far).